It's almost like Rosamund Pilcher's Snow in April.... only it's March and this is Athens, Greece, and I don't know of any budding romances helped on by the snow. I'm sitting here, writing this and my window is a flurry of white dancing snowflakes. I don't know how the weather is in other places in the world right now, or if snow in March is usual for other places and countries, but snow in anytime and especially spring is extremely rare where I live, and it always fills me with wonder. I think, if God tells the snow to fall on the earth, as it says in Job somewhere, then what else is He capable of saying and making happen? Anything, apparently. So, to me, maybe because it is so rare and precious, snow always is a manifestasion of the God of wonders who is my God. In other news, I just finished reading Jellicoe Road by Melina Marchetta, and.... I just can't find the words to describe in how many ways this book touched me. I will press myslef to put my thoughts in a review about this treasure of a book, but I'm almost sure I won't be able to give it justice. I am thankful however for having read it, and that its stories are now permanently written in my heart. It's one of those books, that you are richer for having read. Everybody have a nice week and may everything you do be fulfilling and fruitful. 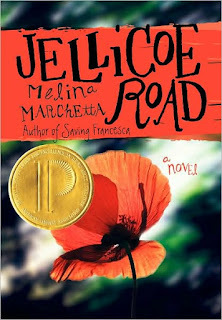 I loved Jellicoe Road too! It is such an amazing book!! !